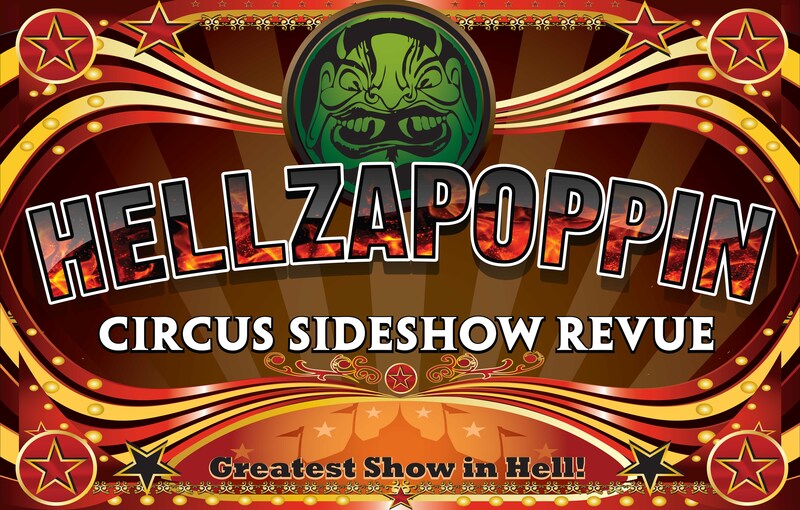 Rebellion Brewing Co. presents Hellzapoppin Circus SideShow Revue. Named after the most successful Broadway musical and movie from the late 30s and 40s, it's a world-renown theatrical rock 'n' roll circus thrill show where some of the deadliest stunts in live entertainment are performed to loud, crowd-pleasing music tracks. Spectators will experience one of the world's last autthentic circus sideshows with performances using the human anatomy and death-defying stunst and demonstrations of mind over matter, yet with no blood and no pain. You've seen them on AMC Freak Show, Ripley's Believe it Or Not!, Guinness World Records, the Discovery Channel, the Travel Channel, America's Got Talent, and more. This vaudeville freak show of wonder features live stunts like fire eating and fire breathing, magic and illusions, bed of nails, the human block head, knife throwing, acrobatic stunts, sword swallowing, and human oddities and curiosities like a real, live half-man who walks on his bare hands in broken, hot shards of glass on fire. Regina rock group the Heavenly Bodies open. Doors at 7 p.m. Advance tickets are $20 and will be available at Rebellion Brewing Co., Vintage Vinyl, Madame Yes, and online. Find online tickets above. Tickets available at the door barring a sell-out. All ages and licensed. PRESENTED BY REBELLION BREWING CO.
Visit Hellzapoppin's website, Facebook page, and Twitter feed.